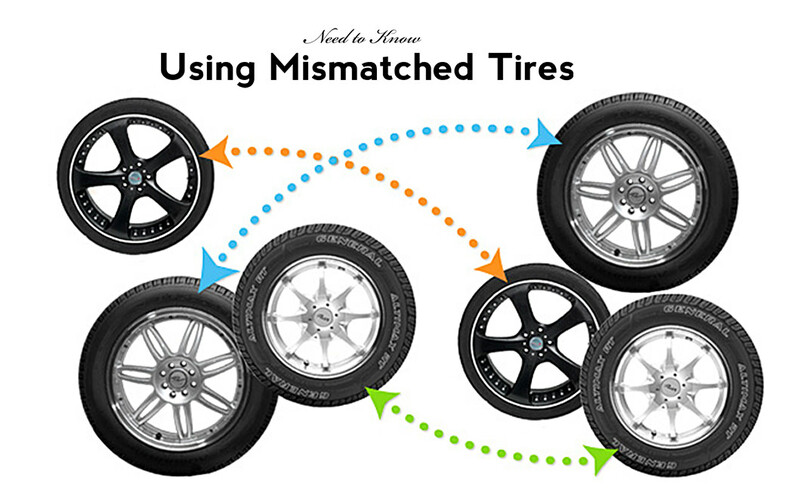 Can You Use Mismatched Tires? If you decide to replace one or two of your tires only, the best choice is to replace them with the exact same brand, style, and size that are already on the vehicle. If this is possible, the dimensions, internal construction, materials, and tread design will be nearly identical to the tires you are replacing. In addition to maintaining control and stability, having a uniform set of tires lets you rotate them regularly. This helps the tires wear evenly, extending their life and making the most of your investment. But even with regular rotations, your tires can still wear unevenly if your vehicle has different-sized tires on the front and back (the “staggered fitment” we mentioned earlier), has an alignment or other mechanical problem, or if you don’t keep up with maintenance. Even driving conditions can cause uneven wear. You could also lose an individual tire to puncture or other irreparable damage. In this case, you may need to decide whether to buy one or more new tires to replace the worn and/or damaged tires, or whether to buy a complete set, forfeiting the remaining life on the non-damaged tires. So, is it okay to replace just one or two tires or do you need a whole new set? It’s always going to be best to replace all the tires at the same time, because it will restore the vehicle’s handling and traction to optimum levels. However, this is also expensive, so we know it’s not always possible. If you decide to replace one or two of the tires, the best choice is to replace them with the exact same brand, style, and size that are already on the vehicle. If this is possible, the dimensions, internal construction, materials, and tread design will be nearly identical to the tires you are replacing. If it’s not possible (for example, if the tire is no longer available), the next best option is to choose tires in the same performance category with equivalent load ratings, speed ratings, handling, and traction characteristics as the original tires. The third option — choosing alternative tires that don’t match any of the characteristics of your original tires — should only be used as a last resort or in an emergency. Using tires with different performance characteristics, load ratings, speed ratings, or sizes can cause the vehicle’s handling to become unbalanced, especially in bad weather. For our clients who have performance tires, low profile tires, or other type of specialty rubber, running into a discontinued line is very common. We have a handful of partner companies we use in our area to help our clients find exactly what they need, and they are able to get a perfect match the vast majority of the time. Some of our more industrious clients have been able to find one or two discontinued tires to complete their set by doing a extensive online searches. If you look for something like “wholesale tires”, “discount tires”, or “tires direct” you may be able to find a tire warehouse that has a few left over tires in their inventory that may not be available at retail. Our web guy recently used PMC Tire to get a pair of discontinued performance tires for a fraction of retail with cheap shipping, so it might be worth a try if you are desperate to find a match and can’t afford a brand new set.